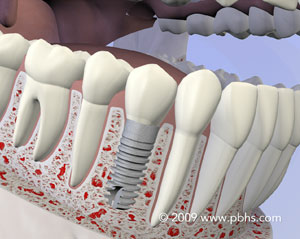 When a tooth is lost, dental implants can be used to help replace it. According to the oral surgeons at SoundView Oral & Maxillofacial Surgery in New London, CT, these are small, titanium devices used to replace the root of a tooth. After your dental surgery (where the implants are placed), your jawbone will begin to bond with the implant. This will rebuild your tooth’s foundation and allow for the placement of artificial teeth a few months later. If you are considering oral surgery to have dental implants placed in your mouth, here are answers to some of the most common questions patients have. Dental implants are usually placed while the patient is under local anesthesia, so you shouldn’t feel anything during your surgery. Afterward, there could be some minor discomfort, but this is usually managed with a non-steroidal anti-inflammatory medication like ibuprofen. How Long Does This Type Of Dental Surgery Take? The time of the surgery can vary depending on how many implants you are having placed, as well as their location. However, most simple dental implant surgeries only last for an hour or less. Many dental implants last for an average of 30 years or more. That being said, you should take into consideration how well they are taken care of. As long as you maintain proper dental care and schedule regular checkups with your dentist, your implants should last for years. Which Foods Can I Eat After The Surgery? Typically, following any type of oral surgery, you should avoid exposing the surgical site to food as much as possible. When you have to eat, try sticking to soft foods and drink plenty of water. Your surgeon should also have a list of approved foods they will share with you. For answers to more questions regarding dental implants, speak to an oral surgeon at SoundView Oral & Maxillofacial Surgery today by calling (860) 443-3619. For more information on this or any other dental procedure they perform, visit them online. And don’t forget to follow them on Facebook and Twitter.